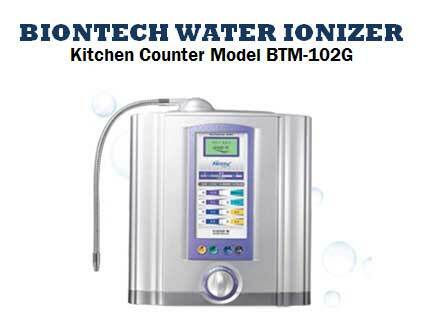 MAINTAINED PH LEVEL: Using more advanced technology, the pH level is maintained regardless of the amount of tap water inflow to ensure the constant quality of the ionized water. ARTIFICIAL INTELLIGENCE SYSTEM: The self-diagnosis system based on the RISC semiconductor notifies the error caused by an incorrect action of the operation function in the form of a message on the LCD screen. Problem solving is made easy. ADVANCED SILVER NANO FILTER: Silver is added to the activated carbon, the core material of the filter to enhance the sterilization power to suppress bacterial growth. 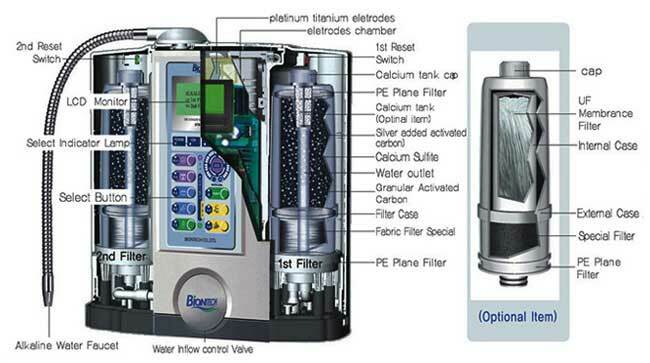 Clean and highly purified ionized water is produced passing through two (2) 12-step water filters. AUTOMATIC SELF-CLEANING AND DRAINAGE FUNCTION: This is performed every 10 liters of water flow to maintain the electrolysis function. As self-cleaning is performed during stoppage (blocking of water inflow), cleaning effect ids excellent. When self-cleaning is completed, drainage is automatically performed. VARIOUS pH LEVELS: There are various pH levels including five for alkalinity (pH7.5, pH8.00, pH8.5, pH9.00, pH9.5, pH 10.00), two for acidity (pH3.5 and pH 5.5) and purification for a wide range of selection and application. FILTER WEAR AND TEAR: The flow rate sensor system employing a digital circuit indicates accumulated usage of filters for close monitoring and management of filter efficiency. Replacement is notified through audio announcement. VOICE MESSAGES: Voice messages and prompts for operation selection functions will makes easier usage of the water ionizer unit. NEW ELECTROLYSIS SYSTEM: Water ionizer uses platinum-titanium electrodes and water-flow dividing system for improved durability and doubled electrolytic reduction (-400mV) for optimal health for maximal elimination of active oxygen (free radicals). WATER SUPPLY ADJUSTMENT VALVE: With the On-Off ceramic valve, user can turn it on or off completely or control the water pressure input.